Teletics manufactures high quality, industrial strength wireless Their products withstand tortuous environments and climates, while working reliably and consistently. Teletics has thousands of systems in operation across the globe and DCE Express is proud to offer these solutions to our customers. 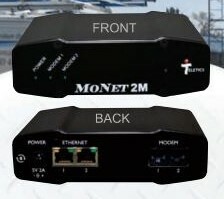 The Teletics MoNet Modem over IP (MoIP) Network Interface devices allow you to access modems over the internet, or through cellular data networks, WiFi, or private Wide Area Networks. Meters, RTU or SCADA devices with embedded Analog Modems can now use ANY IP network, including cellular, WiFi, or private WANs to reduce or eliminate phone line charges, bring service where no phone line exists, and easily integrate into IP networks. The Teletics ZipLine wirelessly extends two phone lines and Ethernet between buildings at a fraction of the cost of trenching cable. Teletics ZipLine Ethernet is the fastest, least expensive way to get ethernet between two locations. No need for expensive trenching of cable, by passing roads, railway tracks, rivers, tarmacs etc is easy.